Indian textiles formed an important item in the trade network, the major thrust being on cotton fabrics in vibrant kalamkari patterns. Mastery over the complex dyeing techniques gave India a distinct edge. THE NEXT time you see a kalamkari sari, treat it with respect, for it employs an ancient technique of dyeing cotton fabric, and the patterns are traditional. India's fabric trade goes back to the Phoenicians who are believed to be the first foreign merchants to come into India (Gujarat), and what attracted them most were Indian cotton fabrics. Cotton cultivation may have begun in India, but it spread over a wide geographical region. From early times, silk was regarded as a sumptuous fabric, while cotton played a more utilitarian role. The major problem with silk is that it requires delicate handling during the process of reeling so as to get a uniform thickness. With cotton the problem involves bonding the dye to the fibre. To absorb the dye, cotton fibre has to be treated with a variety of substances, so that the desired colour ingredients can penetrate the fibre and become permanently insoluble. Mordanting techniques Treatment of a fabric before it is dyed is known as mordanting and Indian mastery over this process gave Indian finished products a superiority in the trade. Some of the major mordanting centres in India were in Gujarat and at Masulipatnam, Kalahasti, Pulicat and the Tanjore region on the Coromandel coast. At these centres Indian artisans developed and perfected various techniques of dyeing decorative patterns on cotton using vegetable colours. Basic techniques for mordanting cotton varied only in that in Gujarat wooden blocks were used for stamping, while on the Coromandel coast the transfer technique and the brush or pen were preferred. Each market had its own layout, motifs and colour and these had to be adhered to rigidly in order to ensure successful sale. Gujarati cottons were sold mostly in African and Persian Gulf ports and in Indonesia, while prime outlets for the southern cottons were Malaysia, Indonesia and the Philippines. Kalamkari is used exclusively for cotton fabrics. The technique incorporates patterns on fabrics through dyes and not through the loom. Ochre is a colour that cotton takes on easily, but for other colours to be absorbed the fabric has to undergo mordanting as the chemical reactions that follow would allow cotton fibres to absorb the desired hue. A fragment of mordant-dyed cotton fibre has been found in Moenjodaro -- proof of the antiquity of the process. Mordant could be applied uniformly or selectively to get variations in colour. It could be applied with a block or with a brush or pen-like instrument (the kalam), on a prewoven fabric called tabby. The patterned cotton textiles were used as decorative or functional hangings, in apparel and as wrapping and covering material. Hence, kalamkari covered a whole range of textiles with the only common feature being the dyeing method. Before the industrial era, only natural dyes were used. It was found that for cotton, which is a cellulose fibre, only two dyes -- indigo and madder -- ensured permanence of colour. Indigo was produced from the leaves of the shrub Indigofera tinctoria. Extraction of indicum, the colouring material, is a complicated procedure involving fermentation to produce a substance called indigo white which is essential for providing the actual dye and it was only in this state indigo could be combined with cellulose fibre. On oxidisation, indigo white is converted into granules of indigo blue which has then to be reduced through fermentation into soluble indigo white, before dyeing can begin. The fabric would first be dipped into a prepared dye vat and then exposed to air, so that the indigo white could revert into insoluble indigo blue and be bonded to the cotton fibre. As oxidisation is very rapid indigo could not be used in block-printing, although techniques were developed in Europe that would allow block printing to be done with indigo. In India, indigo was usually the last colour to be applied to prevent unwanted colour from permeating into the rest of the fabric. The fabric itself would be protected by an impermeable substance called the resist which was made in various combinations of gum and mud or from wax. The preferred medium in the southern centres was wax and a cold process was used. Another technique involved the use of madder for the red dye. As cotton in its natural state could not absorb madder, it had to be treated to enable the dye to bond with the fibre and remain insoluble. The first stage of the treatment involves dipping the cloth in tannic solution after which mordants would be applied. Iron acetate would result in a black colour and alum would make it red. Black was used only to outline patterns whereas for larger areas a combination of indigo and madder, or deep indigo, was preferred. The term kalamkari is derived from the tools used by the artisans to apply resist and mordant. In medieval India a brush-like instrument called the kalam was used. Referring to dye-patterned cotton fabrics from Gujarat and southern India as kalamkari, became the practice after trade links were established with Safavid Persia and some interaction is apparent between the kalamkari traditions of both countries. Extant traditions of kalamkari show two techniques in vogue. The Masulipatnam region relies virtually on the block method while in Kalahasti and Sickinaikkenpet, where the temple influence is more dominant, reliance is entirely on free hand drawing, initially with a charcoal stick to outline the pattern, followed by the reworking of the contours with a kalam. European observers, who documented the Coromandel kalamkari techniques and processes in the 18th century, refer to the practice of the now lost pouncing technique, also used in Iran. The Kalahasti and Sickinaikkenpet technique appears to have been the first to be practiced. The pouncing method probably came from Iran during the Safavid period because of its link to embroidery traditions in Iran. However, an equivalent link cannot be established in relation to south India. 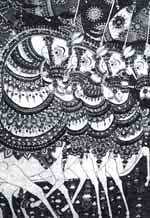 Contemporary kalamkari techniques show various departures from the past. In Masulipatnam, mordant is uniformly printed with a block. Indigo dyeing has been given up and the application of the wax resist by kalam is also absent. Alizarin has replaced seravar and chay earlier used for madder. The mordant for outlining in black remains unchanged, but iron acetate has replaced indigo for dyeing larger areas black, despite its known corrosive qualities. Yellow dyes are made from dried flowers called aldekai (Telugu) or kadukai (Tamil) of the myrobalam, Terminalia chebula. Similarly, myrobalams are used for tanning. Despite the various similarities in the work processes of Masulipatnam and Kalahasti, a major difference is that in Kalahasti there is total reliance on the pen. The process of using the pen makes the contemporary craft at Kalahasti closer to the 17th century techniques than the block prints of Masulipatnam. The use of the transfer technique as an alternative to charcoal outlines is unknown. Since application of mordant is done entirely by pen, no admixture of gum is needed as at Masulipatnam.